There are two charts, small turtles for the ankle and a large turtle for the top of the foot. (I like to think of them as baby turtles and a mama turtle.) 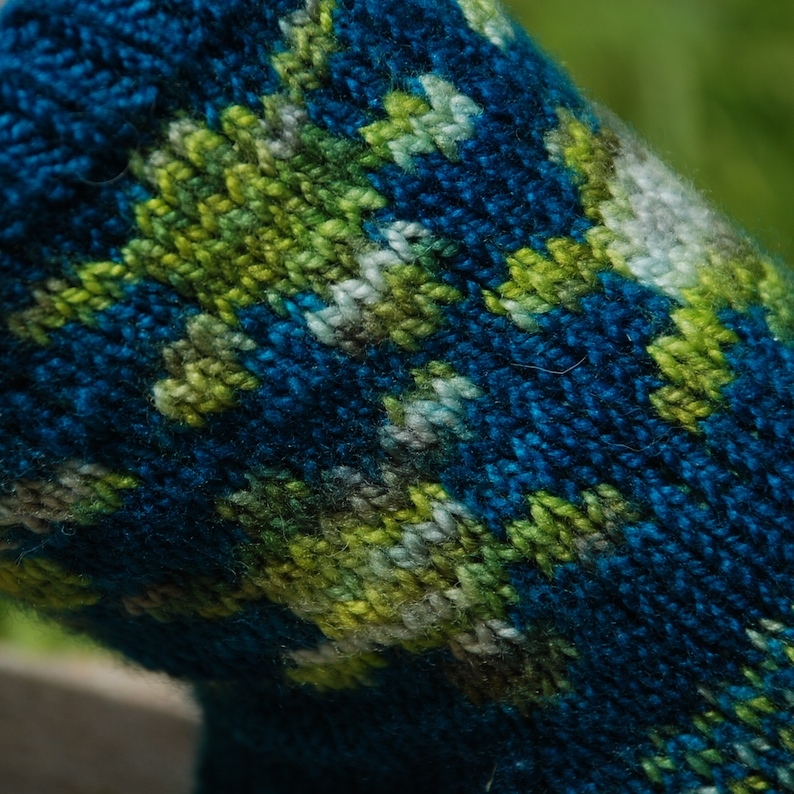 The ribbing, heel and toe are done solid. I worked really hard on the charts and pattern and have decided to offer it for $5. You can buy it at ravelry here. The buying options are in the upper right corner. There is also more pattern notes and info. I plan on writing a detailed post about the design process and such soon. I was just too excited to wait until I could take better process photos. I also said I would do it today so there it is. The photos in this post were taken by a great and helpful friend, Jeannie. (It is really hard to take good photos of your own foot.) Thanks again! I really really really meant to have this pattern done today, but I have failed. Here is a picture and a promise to have it tomorrow. I figure if I tell you all my plan, I will be more likely to follow through. I know what you are thinking, I am a knitter so I am never bored or without something to do. The problem I am facing is that my two current knitting projects are both at the point of needing to read the written/charted directions every row. As much as I think knitting in public is a good thing, it is not ok to bring along charts and multiple pattern pages to follow. I know that I will be totally distracted and I assume I will also distract others. I would consider starting something new, but I already have 2 projects going. 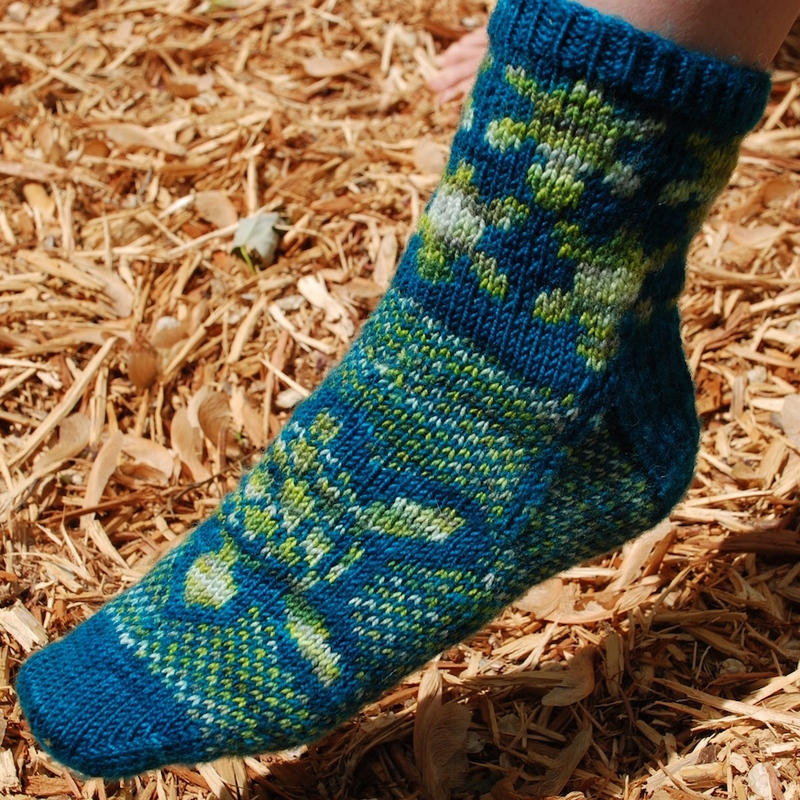 Not to mention, the next projects I am planning are cabled cardigans for my nieces and a fair isle sweater for myself. I need to do way too much work to start either of those projects and again they would not be mindless knitting. This brings me to a sweater that I bring out for just such an occasion. 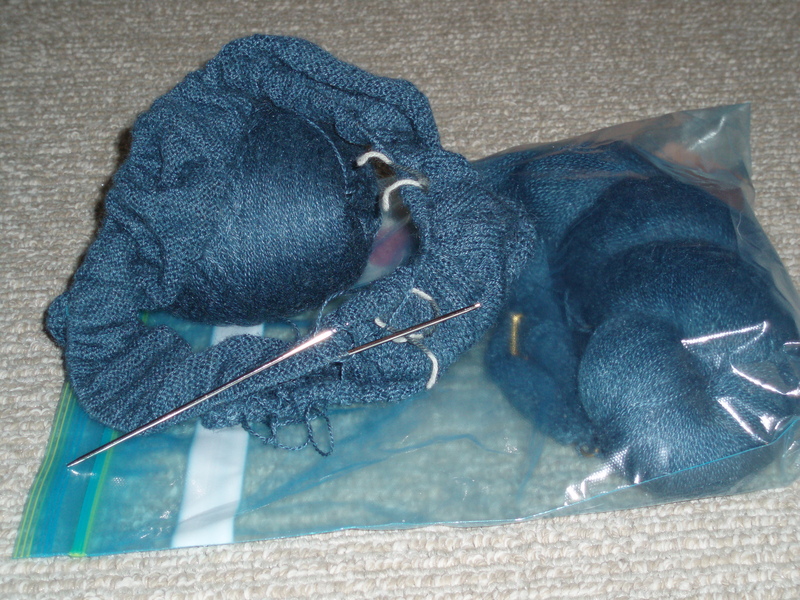 I missed the last day of knit and crochet blog week. The topic was yarn and I love all yarn so I couldn’t pick just one to talk about. Oh well, 6 out of 7 days is decent. I still have a backlog of projects to show you, but instead I am going to show off my latest FO. 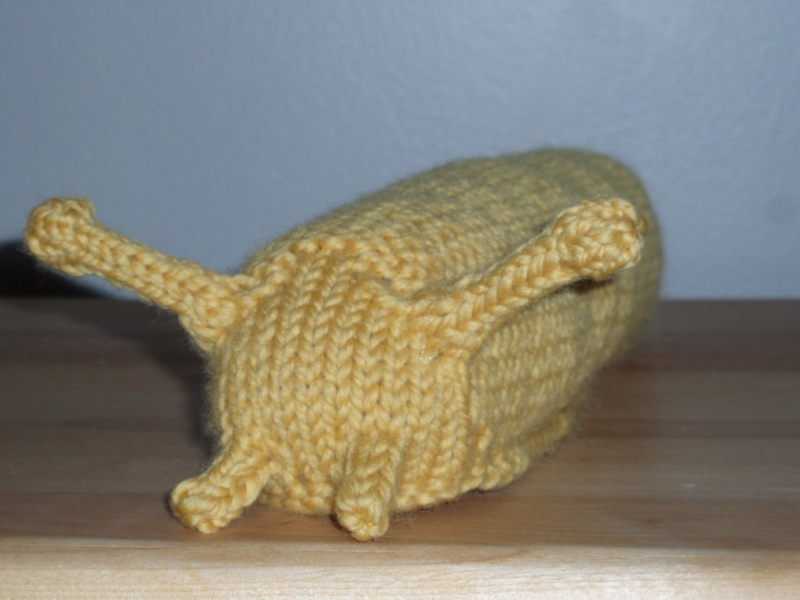 That, my friends, is knitted banana slug. I was surfing around on ravelry and found this. 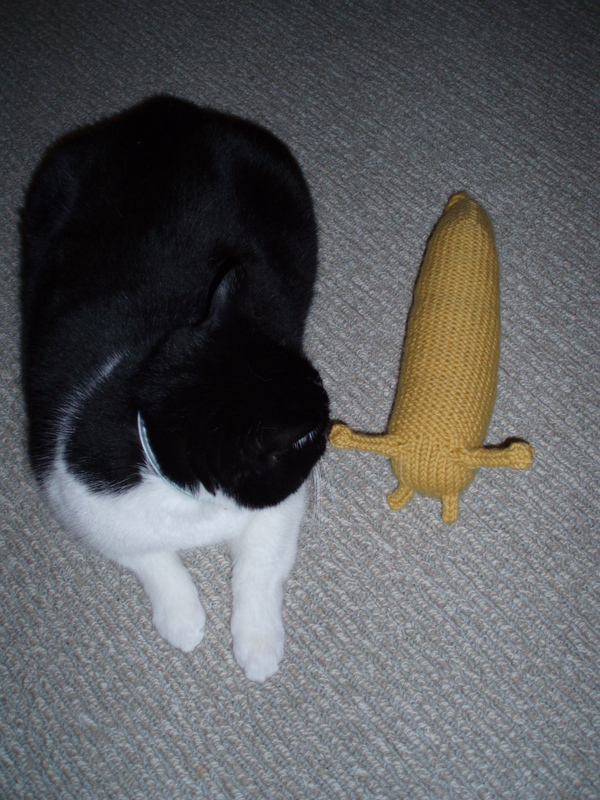 I have a good friend who really likes banana slugs so I immediately decided to make one. I wanted mine to be as big as possible so I bought some Cascade 128 in yellow and used size 8 needles. This was a very quick and easy knit. My cat was not sure what to think. The pattern is Garden Snail by Hansi Singh only in yellow without the shell. The recipient seemed to really enjoy the gift so that is good. I had fun making it. Topic – Revisit a past FO. This sweater is the first I made using a pattern I came up with myself. It is a simple top down raglan with cap sleeves. I like fairly open necklines and this one ended up exactly where I wanted it to. 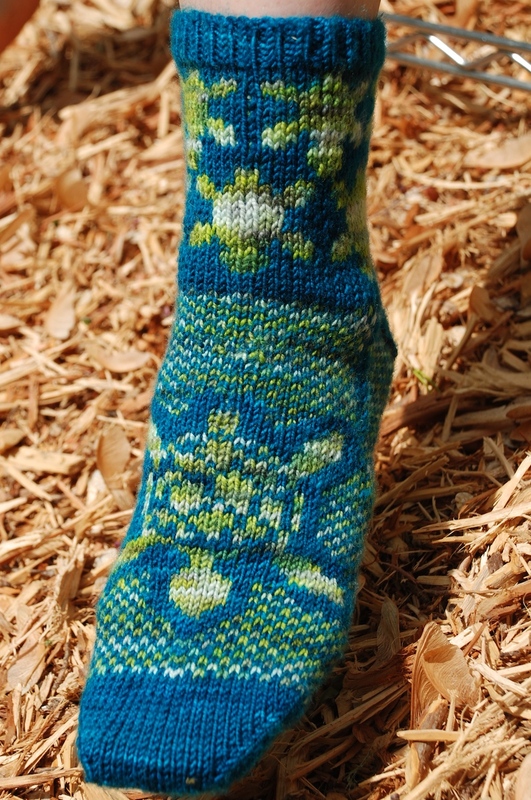 I used Jade Sapphire 2-ply cashmere/silk and size 2 needles. I am showing the following picture of the top because I want you all to see what I get when I ask my boyfriend to take a photo. Can you see the top of my head? Argh. I will admit that photo 2 and 3 all had my head in them, but still. I like the next shot because you can see that my taste has not changed. 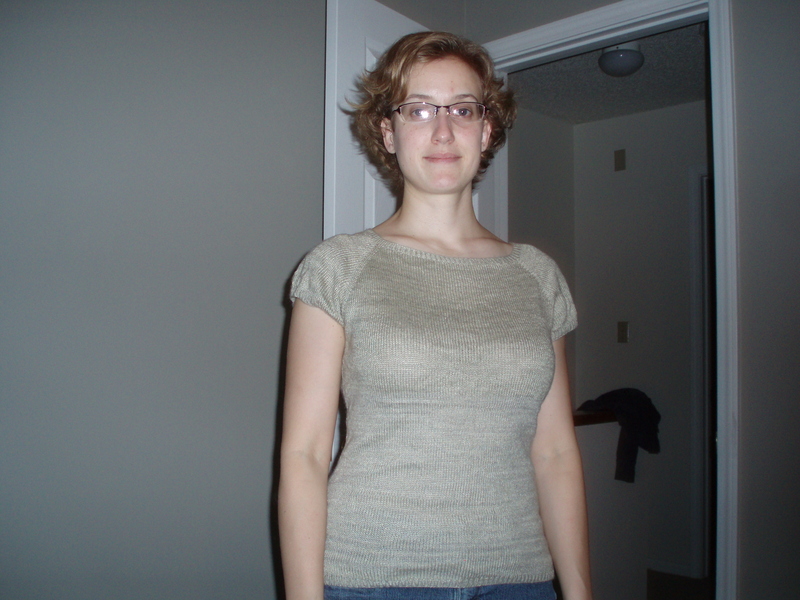 I knit this top about 4 yrs ago, I painted my wall about a month ago. Hmmm. I don’t wear this as much as a should because I am worried about ruining it. I love this top, it is so soft and warm. I really like the fit and simple style, the color is a very pretty silvery green. I am trying to make myself wear my hand knits more so I wore it today and will make a point to wear it more often from now on.